Welcome back to Kathryn Troy, an historian turned novelist who, last time she was here, gave us An Undead History. She has taught college courses on Horror Cinema and presented her research on the weird, unnatural, and horrific to academic conferences across the country Her nonfiction book, The Specter of the Indian: Race, Gender and Ghosts in American Séances, 1848-1890, has just been released by SUNY Press. Her historical expertise in the supernatural and the Gothic informs her fiction at every turn. 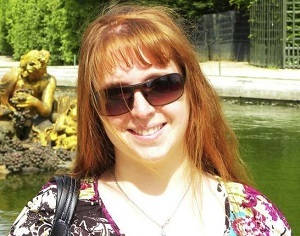 Her genres of choice include dark fantasy, romance, horror, and historical fiction. She lives in New York with her husband and two darling children. Connect with Kathryn Troy at Bathory’s Closet, Facebook, Instagram, Goodreads, and Amazon. One random commenter will win a Kindle copy of Kathryn’s novel A Vision in Crimson. 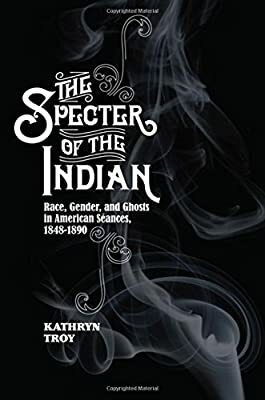 On the way to writing The Specter of the Indian: Race, Gender and Ghosts in American Séances, 1848-1890, I had to learn everything I could about the Spiritualist movement and its forerunners. One of the very obvious facts is that the label “medium” was overwhelmingly ascribed to females. That fact became more and more important in my research as I uncovered interactions between men and women, whites and nonwhites, and the living and the dead. Today I’d like to share some of the context behind the arguments I’ve made about Spiritualism as an integral site of national discourse about race, gender, and religious legitimacy in America. Studies of hysteria and turn-of-the-century Spiritualism are connected through their depiction of women as highly visible figures, something they had not been in a society previously segregated by gender. The images of femininity propounded by these two movements stood in direct opposition to each other. Those who wished to delegitimize Spiritualist gains drew parallels between “the absolute identity of the symptoms,” one critic wrote, “in all characteristics, with those in our day asserted to be due to spiritual possession, and with those met within the various forms of hysteria.” Both mediums and hysterics have the potential to yield complete control to other parties, whether they are men of the medical community or entities from a spiritual realm. Female sensitivity became increasingly visible in public demonstrations of mesmerism, which is acknowledged as one of the origins of neurological science so prominent in twentieth-century medicine. In this arena, women gained the ability to achieve a higher sense of being through their sensitivity by transcending consciousness, allowing them to perceive and understand previously unknown knowledge of the universe. This ability had practical uses, including physiological and mental healing, resulting in the praise of women for their contribution to social progress. “These sensitives and somnambulists,” eminent Spiritualist Andrew Jackson Davis declared, “will soon be sought and counted as the benefactors of their neighbors and countries.” As translators between the two worlds, women became increasingly involved with public speaking, removing themselves from the restrictions of the private sphere, and actively participating in the public sphere by calls for social reform. The political power that women gained through Spiritualism did not go unnoticed. Those who wished to undermine women’s rights did so by undermining the legitimacy of Spiritualism, both as a religion and a science. Although Spiritualism was a highly popular religion in America, it confronted a considerable amount of criticism and ridicule, impacting the women who struggled for autonomy through participating in the movement. Ultimately, the women lost the battle for autonomy within the Spiritualist movement. It would take another angle, that of factory labor, to gain them political legitimacy (i.e., the right to vote). But along the way, they created a fascinating image of their world as striving for perfected sexual division, at the same time that it erased racial difference. By associating with spirit “controls” that were largely Indian, Spiritualists made the case that Indians were not a distinct racial class, or should not be, and began to redefine gender in a way that would erode the racial classifications that had been built for centuries. Book Description: Katelyn knows her magic is risky, but Icaryan light is fading fast and she is desperate. Returning to Earth, she crosses paths with Luca, a vampire hybrid living on the outskirts of humanity. Passion sparks their weary hearts. The rogue hunter follows Katelyn into a world teeming with wonder and danger, forsaking his own quest to root out his father. But his father has not forgotten him. 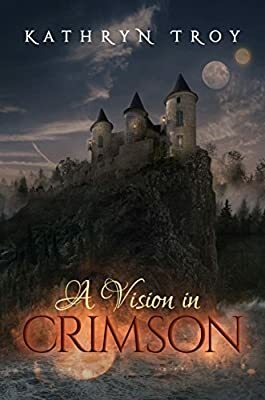 A Vision in Crimson is the first installment of a new epic fantasy blistering with romance and Gothicism. One random commenter will win a Kindle copy of A Vision in Crimson. That’s more than I knew about mediums. Wow, this sounds like a fascinating book! I’ll have to order it. Very interesting look into an area of women’s history that I haven’t seen explored sufficiently before. Definitely something I’d like to read into! Many thanks! Thanks to all for your enthusiasm! I hope you enjoy the book as much as I enjoyed researching it. This looks REALLY good. Thanks for bringing it to my attention!